Some of the patients who visit East Tremont Dental have early-stage periodontal (gum) disease but are unaware of it, because they are not presenting any noticeable symptoms. Unfortunately, periodontal disease can be harmful not only to individuals’ oral health but to their overall health as well. Recent studies have shown a link between gum disease and other diseases including diabetes, heart disease, and stroke. Fortunately, Dr. Sam R. Morhaim, the specially trained Bronx periodontist at East Tremont Dental, can help. Dr. Morhaim recognizes that the best way to reverse periodontal disease is with early diagnosis and treatment. To this end, he uses the most advanced techniques to identify the periodontal concern and either save the affected teeth or replace them, if needed. Periodontists like Dr. Morhaim treat periodontal, or gum, disease, which is a bacterial infection of the gums or the tissues that support the teeth. Periodontal disease is the leading cause of tooth loss. In its early stages, periodontal disease is referred to as gingivitis. As gingivitis progresses, it can lead to periodontitis, the advanced stage of gum disease. If left untreated, periodontitis can damage the jaw bone that supports the teeth, and may cause the teeth to become loose or to fall out. In some cases, the Bronx dentist needs to remove the affected teeth. Periodontal disease is typically caused by a build-up of plaque (bacteria) and, consequently, tartar (also called calculus) around the teeth over time. However, gum disease can also develop as a result of other factors such as chewing tobacco, smoking or the chronic use of certain medications. Patients with gingivitis may experience red, swollen and tender gums that bleed easily when brushing or flossing teeth. However, some individuals with early-stage gum disease do not show any symptoms at all, making it hard to detect. As periodontal disease advances, patients may experience sensitive teeth, loose teeth, pain when chewing, widening spaces in between teeth, chronic bad breath, a persisting bad taste in the mouth, a receding gum line, a change in bite alignment or a change in the fit of partial dentures. Also, pockets may develop between the gum and tooth, and pus may form. In the advanced stages of periodontal disease, the jaw bone starts to recede. The gum tissue may recede as well, possibly exposing the tooth root. When this happens, the teeth become sensitive, and they can become loose as well. Periodontal disease treatment varies by patient, depending on which stage of the disease the patient is experiencing. Early-stage gum disease can be treated without surgery, by meticulously cleaning between the gums and the teeth, down to the roots. The periodontist may also administer topical antibiotics to the pockets between the gums and teeth to prevent infection and help speed healing. Patients with advanced gum disease may require surgical treatment. For instance, Dr. Morhaim may perform pocket reduction, during which he folds back the gum tissue and eliminates the bacteria concealed within the tissue. If the supporting bone structure has already been damaged, it may be abnormally shaped. 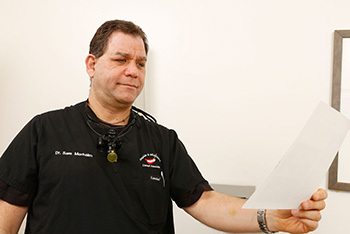 In this case, Dr. Morhaim smoothes the bone to prevent bacteria from accumulating. He can then more easily reattach the gum tissue to the healthy bone. Another surgical treatment option involves the use of tissue grafts or certain proteins to regenerate gum tissue and jaw bone. The easiest way to help prevent periodontal disease is to practice good oral hygiene. This means brushing your teeth properly at least twice a day, flossing every day and using a fluoride mouthwash. Not smoking, eating a healthy diet and visiting East Tremont Dental for all your regular dental check-ups and cleanings also help prevent gum disease. If gum disease is left untreated, it can be extremely harmful to your oral health, so contact East Tremont Dental immediately if you experience any discomfort or pain around your teeth or gums. To learn more about periodontal disease or to schedule an appointment with Dr. Morhaim, please contact East Tremont Dental by calling (718) 823-3000 today.